All of our games move outdoors this time of year and I love creating pretty takes on my favorite nostalgic outdoor summer games, like this extra large jigsaw puzzle or a colorful ring toss game. Lately though, we’ve been playing A LOT of frisbee. I love a good frisbee game since it can fit in our beach bag and be played anywhere we might land. Plus you can play frisbee with any age kids and any amount of people. It’s basically the perfect summer outdoor game. Turning our ho hum frisbees into pretty bright colored flowers makes the entire game feel much more fresh & fun. 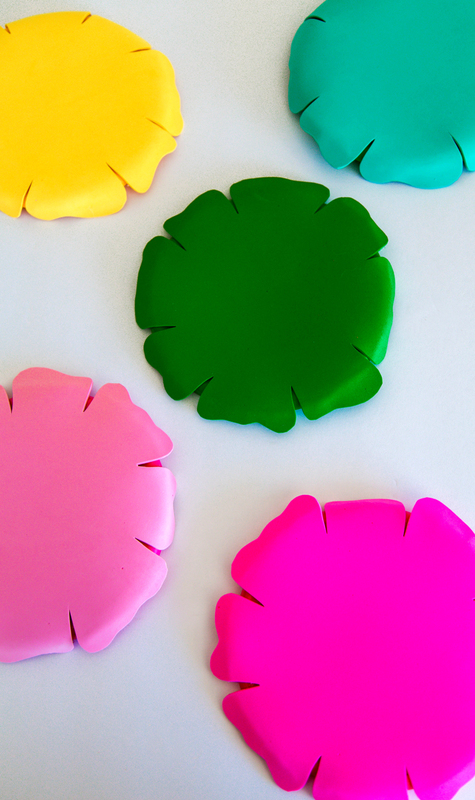 Make a set of these frisbee flowers and take this summer outdoor game to a new level of awesome! The flowers throw and fly just as they basic frisbee would, but look much prettier while soaring through the air. 1. 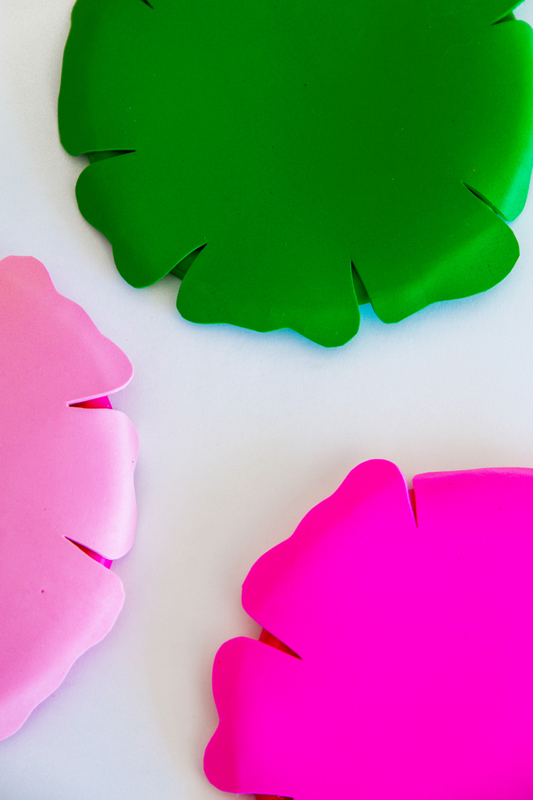 Start by cutting out the flower from the colorful foam using your flower template as a guide. Although you could make this project with paper, the foam actually adheres better to the frisbees and it makes them waterproof for that accidental miss on the sideways toss. 2. 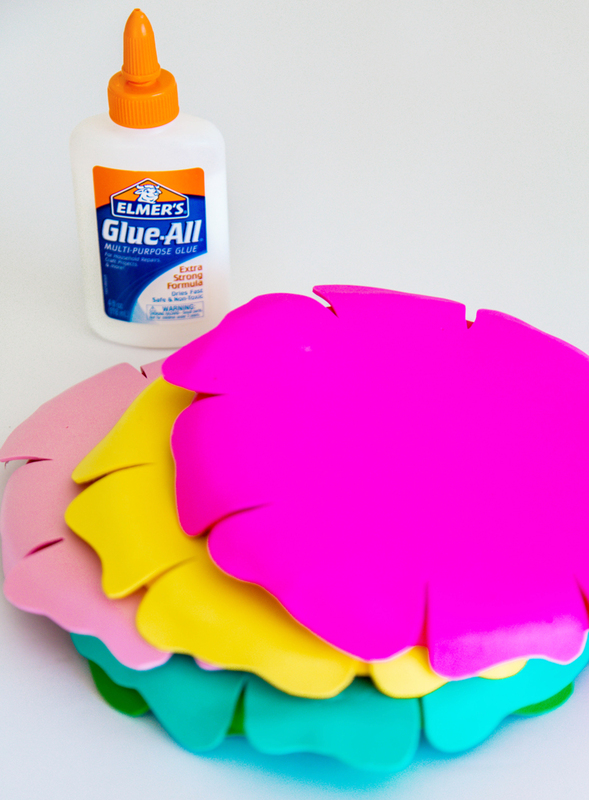 Use the Elmer’s multi-purpose glue to attach the foam to the frisbee. Allow the frisbee to dry completely. 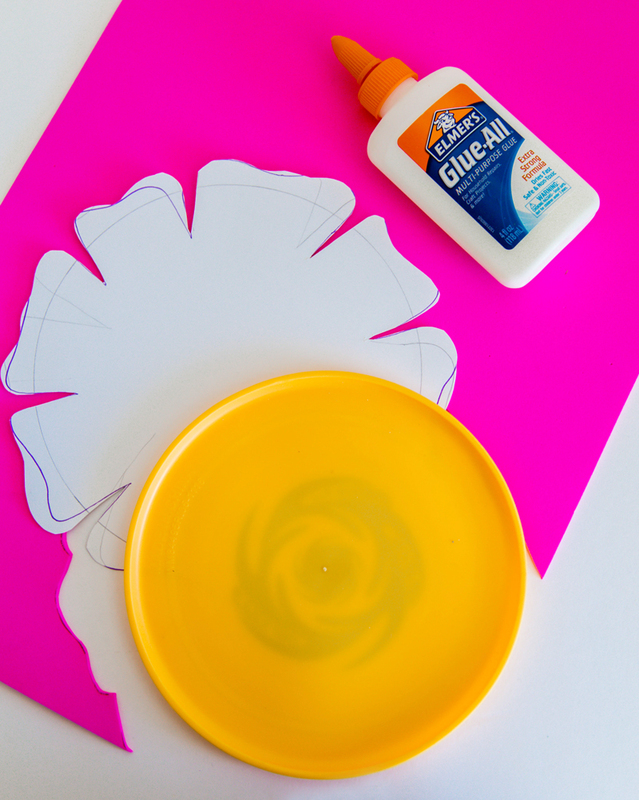 This glue is one of our favorites to use for projects like this, because it is strong enough to hold the flowers to the frisbees even while tossing them on the beach, but it doesn’t glob up like some other glues. Instead it goes on light – making sure your frisbee is still able to catch the breeze and fly just as high as any frisbee could. 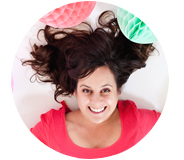 Make a set of these to share with friends for a summer of pretty beach day fun. PS. The frisbees also make great party favors for a flower party, especially when combined with this flower garland and a pretty flower cake! This post is done in partnership with Elmer’s Glue a brand we use around the studio daily.